With less than a month to go before the official start of summer, it's not only high time to scope out the new beaches you should check out, but also what sort of swimwear to rock for the season. No one wants to see you in that ratty pair of board shorts you've been squeezing into since 2008, so why not upgrade to a fresh look? 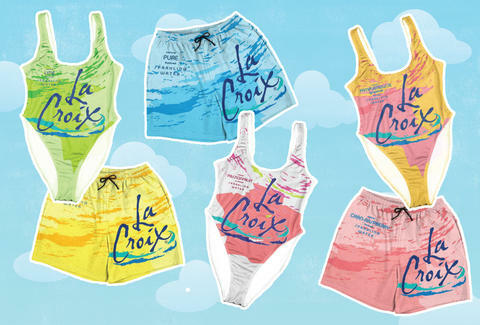 Fortunately, this year you have some truly crisp and refreshing new options, thanks to a whole new line of LaCroix-themed swimsuits modeled after cans of the wildly popular, lightly flavored fizzy water. The handiwork of Los Angeles-based designer Eric Wu, this colorful batch of bathing suits features five one-piece options for gals and five trunk options for guys, each inspired by one the brand's five most ubiquitous flavors: Pure, Lemon, Lime, Passionfruit, Pamplemousse, and Cran-Raspberry. That gives you several pastel color options to consider in terms of which will best showcase your bod as it morphs from pasty to tan during your days by the water over the next few months. Just make sure you know how to properly pronounce what you're wearing. Although it may cut into your monthly bubbly water budget a bit, you can score your very own one-piece or pair of trunks right now from Wu's e-shop Public Space for $49.50 or $39.50, respectively. And, hey, why not double down on the whole theme and practice concocting some delicious LaCroix cocktails to sip while you're wearing them.